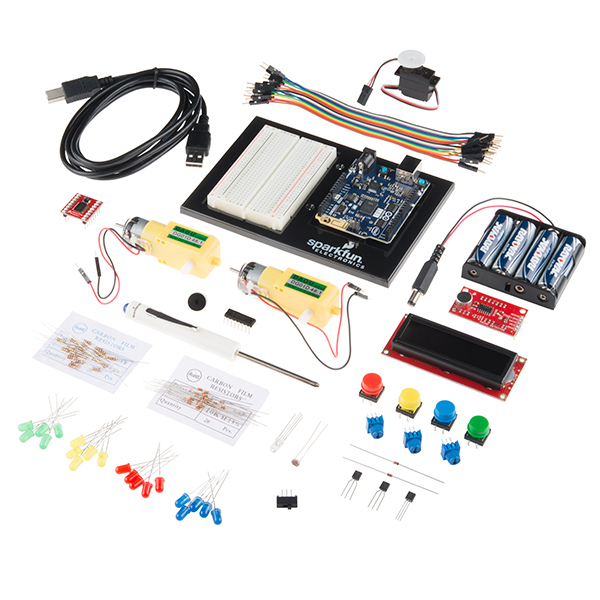 Note: The Arduino 101 / Genuino 101 kit has been retired from SparkFun's catalog. This tutorial is still here for you to read and enjoy. This SparkFun Inventor's Kit Experiment Guide is your map for navigating the waters of beginning embedded electronics using the Intel® Curie-based Arduino 101® or Genuino 101® board. This guide contains all the information you will need to explore the 21 circuits of the SparkFun Inventor's Kit for the Arduino 101. At the center of this guide is one core philosophy -- that anyone can (and should) play around with cutting-edge electronics. When you're done with this guide, you'll have the know-how to start creating your own projects and experiments, from building robots and game controllers to IoT (Internet of Things) and data logging, the world will be your oyster. Now enough talking -- let's start inventing! Note: For the purposes of this tutorial, we are using the Arduino 101 board. Alternatively, the Genuino 101 board, the SparkFun Inventor's Kit for Genuino 101, and Genuino IDE software could be used with any experiment in this guide. Arduino 101/Genuino 101 -- The Arduino 101 or Genuino 101 board. Arduino and Breadboard Holder -- A nice holder for your Arduino 101 / Genuino 101 board and breadboard. Carrying Case -- Take your kit anywhere with ease. 3.3V 16x2 White on Black LCD (with headers) -- This is a basic 16-character by 2-line display with a snazzy black background with white characters and an operating voltage of 3.3V. 74HC595 Shift Register -- Simple shift register IC. Clock in data and latch it to free up IO pins on your RedBoard. NPN Transistors -- This little transistor can be used to help drive large loads, or to amplify or switch applications. SPDT Switch -- This is a high-quality Single Pole - Double Throw (SPDT) switch that fits well into a breadboard. ** USB A to B Cable** -- This 6' cable provides you with a USB-A connector at the host end and standard B connector at the device end. 10K Trimpots -- Also known as a variable resistor, this is a device commonly used to control volume and contrast, and makes a great general user control input. Piezo Buzzer -- Use this to make sounds and play songs. 100 Ohm Resistors -- Great current-limiting resistors for LEDs at 3.3V, and strong pull-up resistors. SparkFun Motor Driver -- This nifty little board is perfect for controlling the speed and direction of up to two separate motors. SparkFun Sound Detector Board -- A microphone breakout board that has three outputs: raw audio, envelope and GATE. This board is perfect for simple sound-based projects. The following is a list of the experiements you will complteye using this 101 SIK Experiment Guide. Alternatively, you can navigate around using the buttons on the right. What is a Circuit? - In this guide, we will be building a variety of circuits. Understanding what that means is a vital to understanding the Inventor's Kit.